The Social Protection Minister’s dismissing any suggestion that her strident negotiating style could hasten the end of the coalition government. JOAN BURTON IS dismissing down suggestions that her election as Labour leader and Tánaiste could spell the end of the coalition government. The Social Protection Minister is vying with junior health minister Alex White for the top job in the party. Speaking to RTÉ’s Seán O’Rourke this morning, she rejected the notion that her strident negotiating style could hasten the end of the Fine Gael-Labour partnership, if members voted for her to take over from Eamon Gilmore. “I have quite a lot of experience in negotiation,” Burton said, before going on to talk up her experience as Minister of State for overseas aid and her more recent tenure at the Department of Social Protection. She said that after negotiating three “very good budgets” she still maintained positive working relationships will all of her ministerial colleagues. “I think they’re all still still talking to me,” she said. And I intend to keep it like that. Burton said she would have two main priorities if elected as leader: working to ensure that working families felt the effects of a “modest recovery”, and negotiating to ensure Europe fulfils a 2012 pledge to break the link between bank and sovereign debt. “As a country as a government, we should be unrelenting in getting further relief from Europe as we were promised in 2012,” Burton said, adding “Europe owes us on that”. That’s a difficult and a delicate negotiation. Burton said “many Irish people, including myself, cringed when we got all the pats on the back, not accompanied by the extra relief”. 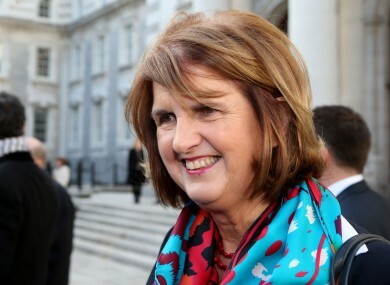 On the subject of the “shellacking” handed to the Labour party by the electorate in the recent local and European elections, she said she felt a “significant number” of people, particularly in Dublin, had stayed at home last month, as they “didn’t want to vote for extremes”. “We have to show that we have an infrastructure that allows us to compete in the modern economy,” Burton said. She said that by the time the next election took place “people will by then be beginning to enjoy a modest economic recovery”. On the subject of the upcoming reshuffle, she said that in regard to Labour front-bench members “the understanding is there will be changes”. Regarding the question of whether the number of Labour portfolios could be altered, she said “there may be some scope for that” before adding “I don’t want to go ahead of myself”. She indicated that Brendan Howlin may be asked to stay on as Public Expenditure Minister, saying that both he and Finance Minister Michael Noonan had instilled “a huge amount of public confidence” which in turn had helped restore international confidence in Ireland. Email “Burton: All the Ministers are still talking to me... and I intend to keep it that way”. Feedback on “Burton: All the Ministers are still talking to me... and I intend to keep it that way”.